Pub in Chigwell, fairly near the station. 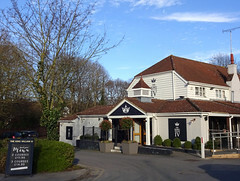 It's owned by Mitchells & Butlers, and as of 2017 is part of their Premium Country Dining Group sub-brand (see old version of this page for what it was like before). It certainly seems to be a dining-oriented pub, with sturdy dark wooden tables ready-set with cutlery, napkins, side plates, and wine glasses. It's fine to come in just for a drink, though, and indeed the high tables and chairs near the entrance seem to be set up specifically for this. Kake visited on a Thursday afternoon in March 2017. There were a fair few people in when I arrived just before 3:30pm, some of them just finishing off lunch, and there were more outside on the patio, enjoying one of the first properly warm days of the year. Music was playing, a little louder than ideal for conversation. There weren't any handpumps for real ale, but they did have keg taps for Meantime beers, Peroni, and that sort of thing. A pint of lime and soda was £2. Accessibility: No steps to get in. Some of the seating is up a couple of steps, but there's a reasonable amount on the level. On our March 2017 visit, all the normal-height seating on the level was ready-set for diners, but they didn't seem to mind us sitting there just with a drink. Toilets are up two steps. Last visited by Kake, March 2017. Last edited 2017-03-11 19:40:38 (version 6; diff). List all versions. Page last edited 2017-03-11 19:40:38 (version 6).